dSim improves upon Alea 3.0 (Klusacek 11/17/2014; Klusáček and Rudová 2010) and GridSim (Albin et al. 2007; Buyya and Murshed 2002). GridSim is a discrete, event-based toolkit that uses the Java language (McGill 2008) (p.56–75). 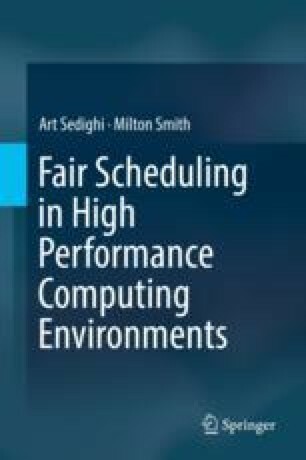 It allows components to be modelled and simulated in parallel environments, and it can be used to evaluate scheduling algorithms. It can also create different classes of heterogeneous resources and enables such resources to be managed using a user-defined scheduling algorithm. Even though GridSim allows environments to be managed via a graphical user interface, GridSim’s framework was of greatest interest because it allowed us to customize our interactions with the environment. Alea expands upon the GridSim framework, enabling the evaluation of various scheduling techniques. dSim extends the framework created by Alea 3.0, enabling scenarios to be automated and simulated by varying the number of users, the types of job profiles, and the number of resources. Most importantly, it includes a simulator clock. dSim uses a (bucket) Placement Counter (PC) to keep all of the tasks synchronized in buckets. Each tick of the PC is a new bucket, in which events like task submissions, gatherings of results, and scheduling events are synchronized. The duration of a single PC tick was set at 1000 ms (1 s.).